One of the fun things on the Nikon D200 is the build-in flash; it can be used to command groups of external Speedlight flash units. As cool as this sounds, how is this new? For years photographers have been using multiple studio flashes to light their subjects. Well yes, but those are usually really expensive, and wired. Before CLS, you had to use cables, or un-controlled remotes, making it very difficult to nicely light an image. The Nikon Creative Lighting System is an ingenious system that allows a "commander"-flash unit to send infra-red signals to a theoretical unlimited number of other flash units. Divided into groups, you can set the strength of each flash the way you like it, and the commander calculates the correct exposure for all these flashes. This makes it quite easy to be very creative with your lighting. As I only have the build-in flash of the D200, and one SB-800 which can function as a remote, there's already quite a lot of cool stuff I can do with directional flashing. 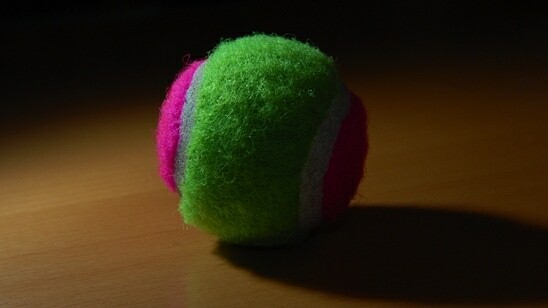 To the right is a picture of the set-up I used to create the image of the ball. 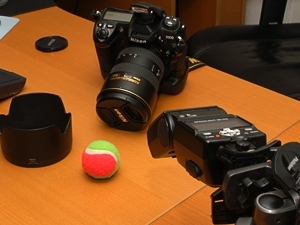 The SB800 is on a small tripod and directed close to the ball. No diffuser is used, to give a spotlight effect. The on-board flash of the D200 fired only to control the SB800, and had power turned down, so the picture retained a lot of detail in the shadowy areas. Unfortunately it can't be turned off completely, as it uses the flash of light to send information to the external unit. For a more in-depth look at CLS, have a look at this article on Nikonians.org.